This lovely figurine features a Monkey holding a Ruyi and sitting on a a majestic Elephant. 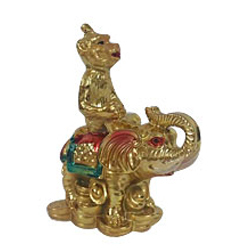 Intricately crafted from brass and plated in gold color, it is accented with colorful crystals to result in an amazingly stunning and exquisite work of art.The Golden Monkey with Ruyi sitting on Elephant is thus the Feng Shui item to own if career and business success is high on your list of aspirations. Place it in the North sector or on your work desk.